The Ballet Académie is privileged to be a part of the cultural community in downtown Lafayette, walking distance to the many restaurants, parks and museums. Our 8,000 square foot building houses The Ballet Académie, The Music Room and Basin Arts located in the Downtown Lafayette Cultural District at 113 Clinton Street. The Ballet Académie offers studio space with a dance floor of over 1,200 square feet fitted with Harlequin marley sprung dance floor providing safety and ease on the dancer's body, a conditioning space, dancer waiting area and a viewing window to observe classes. Visit The Music Room to learn more about music lessons with Danny Devillier, teaching drums, piano, guitar, bass, theory, composing and songwriting. Visit Basin Arts to learn more about our neighbor and collaborator in bringing creativity to Acadiana. Or stop by for a tour of both TBA and Basin Arts with a convenient parking lot and free street parking for easy access. Between TBA and Basin Arts there are two available spaces for rent. This second floor studio space offers a 1200 square foot sprung, Harlequin dance floor well suited for ballet, modern and jazz. No tap dance or heels. The dance area has a full wall of windows overlooking Downtown Lafayette, a speaker system compatible with aux port, and wi-fi. The Ballet Académie space is a more private studio space area and works well for more intimate rehearsals and classes. The first floor studio space offers an 820 square foot sprung, Harlequin dance floor acceptable for ballet, modern, hip-hop, jazz, tap, and more. No heels. The dance area also has a full wall of mirrors, a power speaker system compatible with aux port, and wi-fi. The Basin Arts dance space is a shared space which opens up to our art gallery and semi-private visual arts studio spaces. 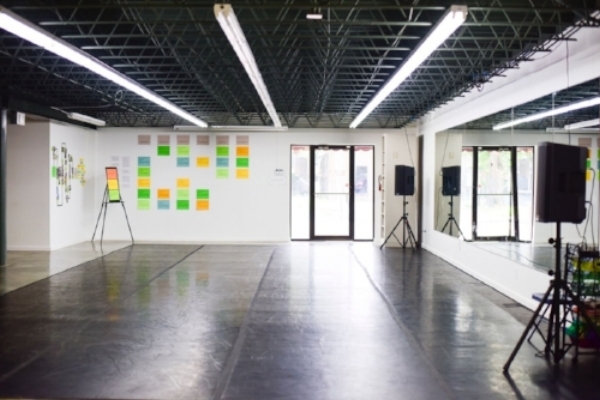 This space works great for classes and workshops in dance, theater, or any other movement idioms and can offer a wonderful option for public showings and performances as well.